Yes, there is a separate faire in the fall near Gilroy, California, The Garlic Capitol of the World. I posted about that faire some months ago. It has pictures if you scroll down. What do you think of my kitchen project? I haven't turned it into reality yet. I used special web app for kitchen constructing. Its demo appeared to be free I've just completed planning it some days ago, but I can't wait to start remodeling. So I decided to renovate the room completely starting with kitchen cabinets to the backsplash. Looks cool. Can you fit an island in there? So, after a year of working on plans and the construction loan, which was then followed up with 15 weeks to get a permit, our addition with kitchen remodel began demo on Wednesday. It is going to be very exciting to see it all come together -- for now we are definitely keeping our Bluestar stove, adding a Bluestar salamander (which we drove from Chicago to DC to pick up a year ago) and a Wolf Steam oven, which I bought on super sale at a local appliance store. For now, our old kitchen is mostly intact while we wait to get under roof on the addition, at which point I will be cooking exclusively sous vide/grill for a couple months. Which, isn't so bad....More pictures to come as it goes along. I was thinking perhaps it would be better to start a whole new topic...makes sense? Any interest? Ok cool -- as soon as the kitchen demo begins, I will start a new topic. Some of you may remember my kitchen in NYC. It was 6' x 7' and while I liked that it was cozy, I was seriously lacking for space. I mentioned in my intro thread that the kitchen in our flat is easily my favorite room, for the reasons you'll see below. 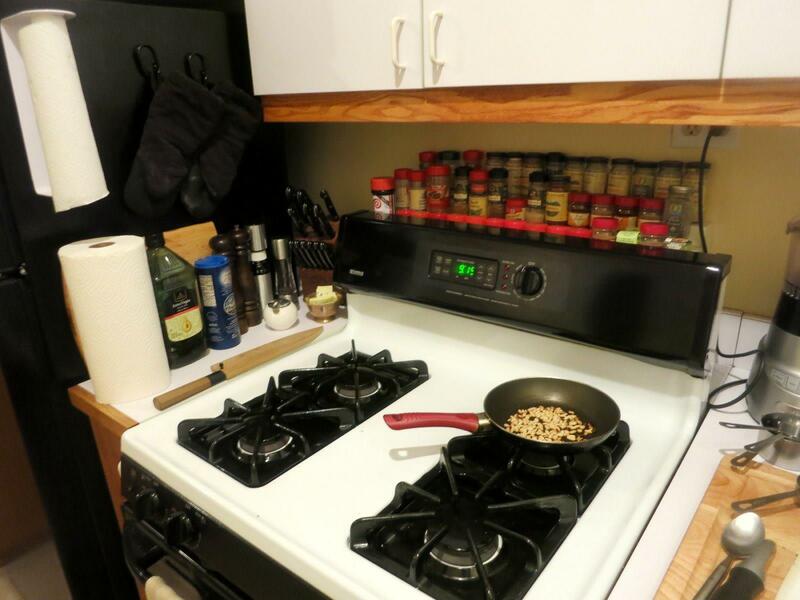 The spices are technically not on top of the stove but on a ledge that sits behind the stove. Not a good place to put them, but we're short on that, ironically. Most of those are old and probably need to be tossed at some point. 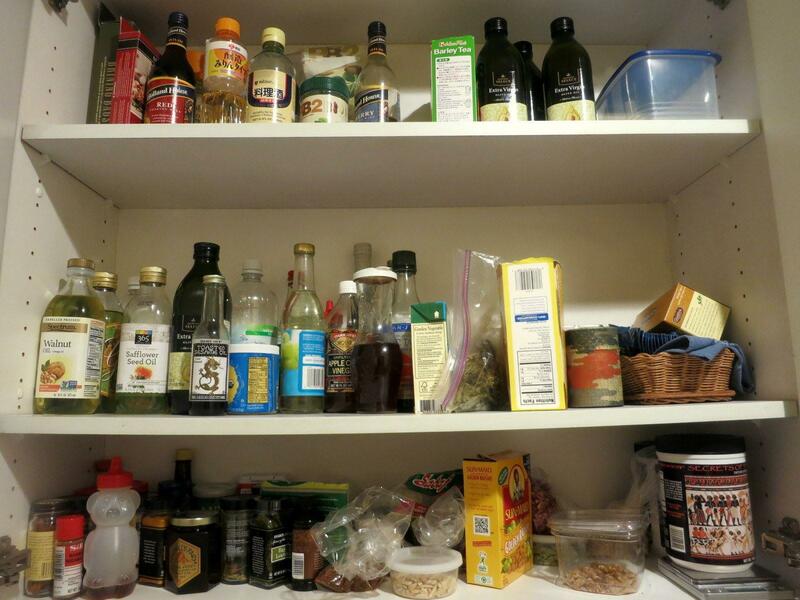 I keep the newer stuff in the cabinet above. 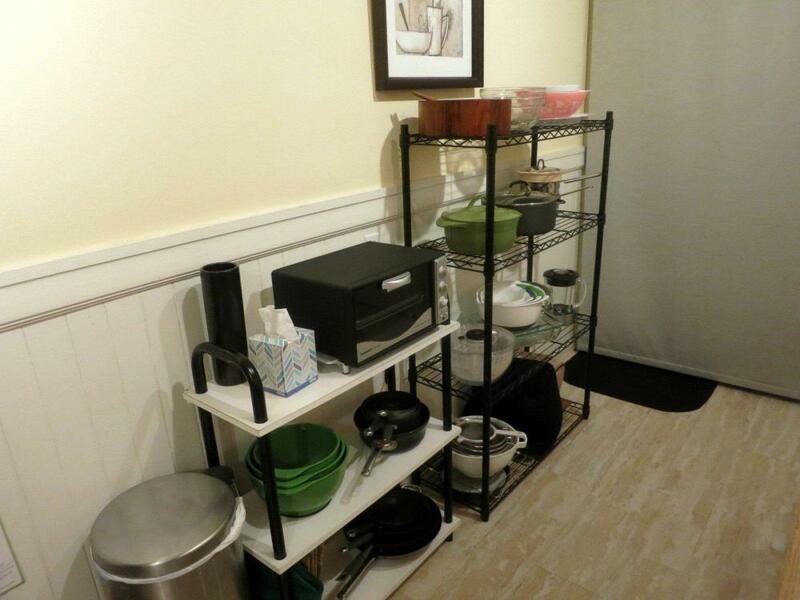 The cabinet that's peeking out to the left of the stove holds baking sheets, cookie sheets and other assorted pans and racks. The machine next to the slow cooker is a Japanese rice cooker. 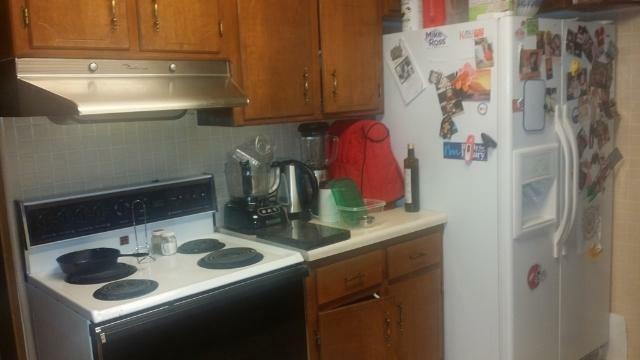 There are cabinets and drawers to the right side of the island that hold more dishes, Tupperware, more pots and pans and various miscellaneous things like kitchen towels, mittens, matches, kitchen shears, toothpicks and the like. This section was re-organized after I moved in so I wouldn't spend a lot of time looking for stuff. The green Dutch oven is one of a very small handful of pots and pans that made it to California. Ditto for the blender which is part of a combo food processor that B bought for my 44th birthday. 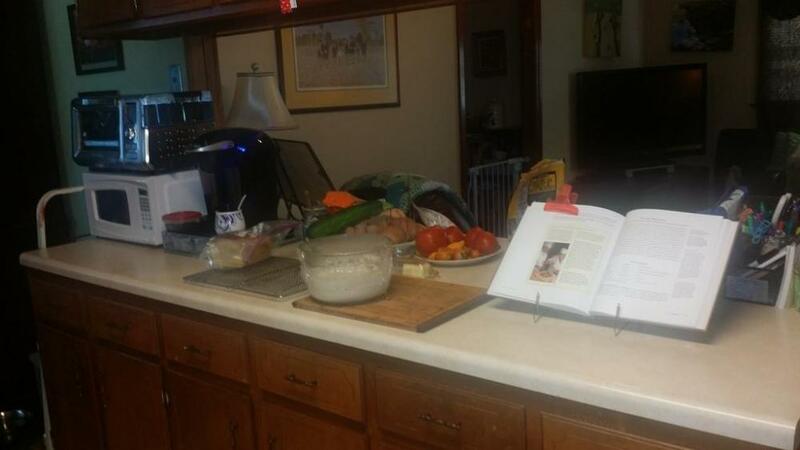 This is the main countertop where a lot of my prep work occurs. The food processor also has a blender attachment. The knives I use most often are (1) a Japanese chef's knife from Bernal Cutlery (see link below) and (2) the silicon knife you see in the foreground at center-left. I have a photo of the front section that I would dearly love to upload but the photo uploader thingie isn't behaving -- it's treating the pic as 100 x 100 pixels which is not at all the case b/c the original is actually 1600 x 1200. Very frustrating. Maybe I can load a different pic when I get home. 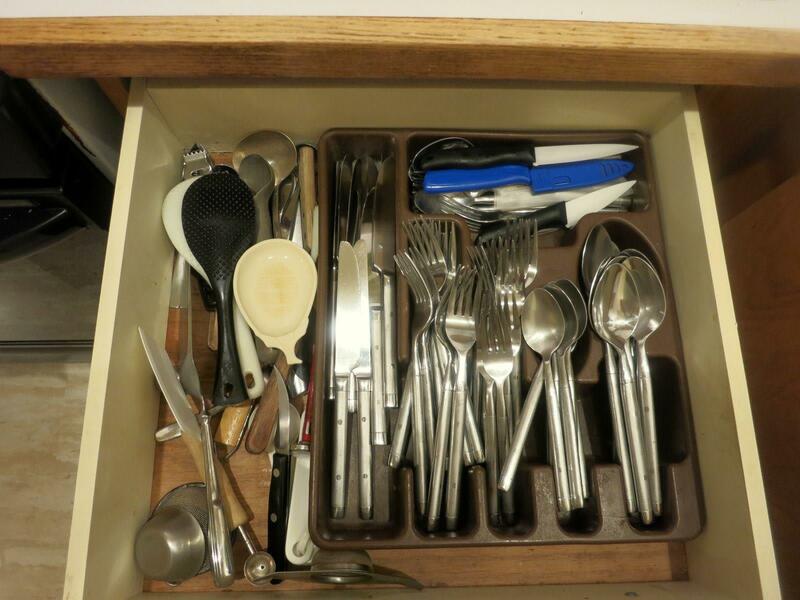 Part of the kitchen-gadget drawer which also doubles as our silverware drawer. No chopsticks -- B uses them to eat with, and I don't bother with them. I used to know how to use them but when I emigrated to the U.S., I lost that knowledge and never re-learned the skill. Maybe one of these days, but I rather doubt it. There are three more drawers below this one. Immediately below are another utensil drawer for tongs, spatulas, spoons and whisks. The one below that holds aluminum foil, plastic wrap, plastic baggies, parchment paper, etc. The one below that has lids for various pots and pans. We love our kitchen, clearly. We have tons of olive oil because I tend to go through it like water. This pic was shot in November 2015 -- I can guarantee you that the amount of "stuff" has ballooned since then. The glass jar in the middle is a jar of preserved lemons (Meyer lemons, kosher salt, olive oil, rosemary, peperoncini). It's about half gone at this point unlike in the pic above. 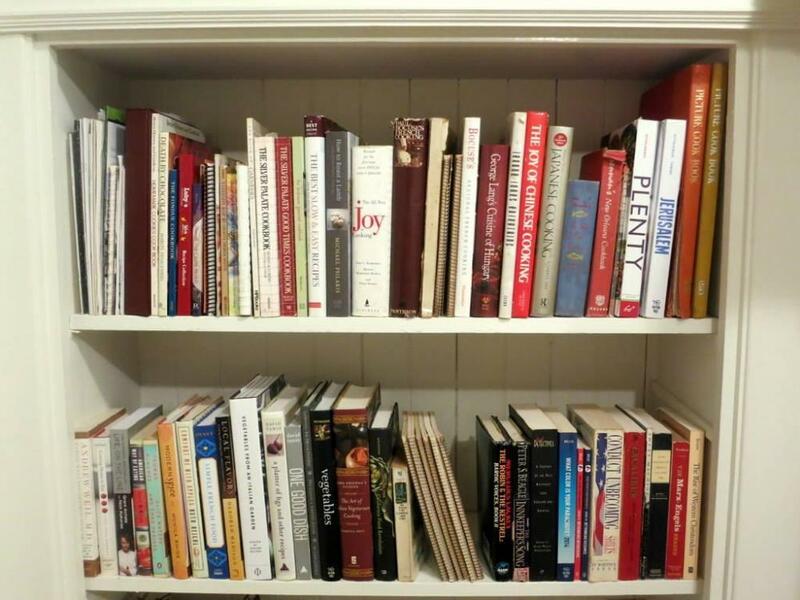 As for our cookbooks, they're in a room dedicated just for them. It's a small but growing collection. I've added about 10 books since these pix were shot, most recently a Basque cookbook that I will soon post about. Oh, and I forgot. Above the kitchen cabinets are where we keep our copper pots and pans (which I should really use more often), and B's Kitchen Aid mixer. Damn the lucky fucker. LOL. I've always wanted one. Dang...I am developing a serious case of kitchen envy. Vulcan stove? All that cool shelf space? the puppy? Islands? My kitchen is still in the design stages, and drywall starts next week. I've settled on a soapstone countert op for the main counter. The island- thinking of butcher block. Found some good kitchen "hacks" on Pinterest, though I fear I am driving the kitchen designer mad with all the links I send her. One of the coolest is the paper towel holder. You know that do-nothing, fake "drawer" panel beneath each sink? Pop it off, and insert little rods to hold the paper towel. Love that. Root bins are another alteration I found. Old wooden plate racks/shelves- painted to match the island, though I don't know what color yet. Cupboards/Cabinetry is white, distressed with windows on the upper section. Flooring is oak. Wall color---Greige. (warm grey, I guess you could say.) Toying with a distressed blue, red or sage green for the island and plate racks. I can't decide. I do have the 36" Bluestar range ordered. I'll take pics of the space and post it once the drywall is in. ChocoMom .. 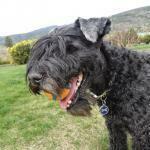 I guarantee you will LOVE the soapstone - especially if you are not the fussy kind. You 'can' oil it if you want but you don't 'have' to (and it will eventually darken all on its own anyway over time .. and acquire its own patina). 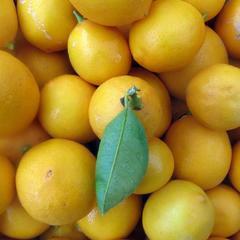 Has such character, the 'cool' factor (temperature that is), the 'can take the heat' factor, and such a lovely texture .. I love to run my hands over the counter I have in NC .. just wish it was here in NS instead since I am going to sell that house and putting in soapstone here (though it would suit the house and me) is just not worth the investment again. Glad I had a soapstone countertop at least once in my life though. Your design sounds divine! 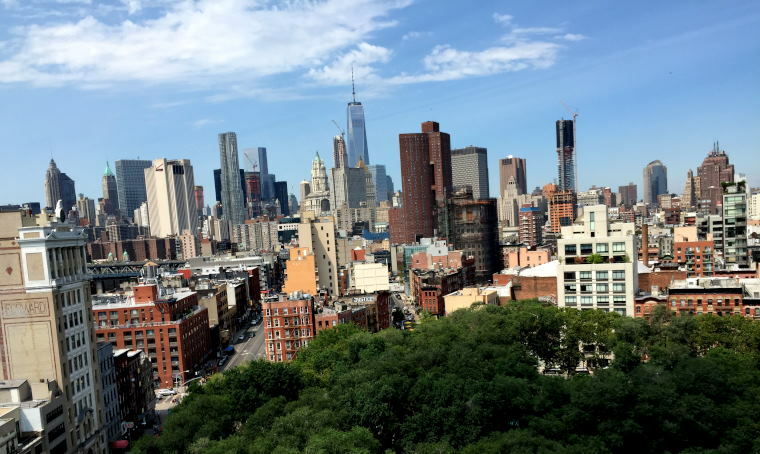 I know this has been a busy, trying time for you but other than what took you there, it all sounds so much fun to be putting this all together - just the way you really want it. 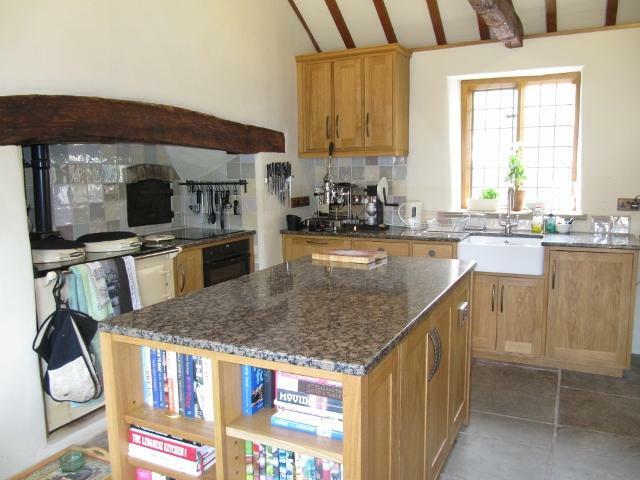 Here's my kitchen remodelled in 2007 shortly after we bought the house. The plan had been to live with the original kitchen for six months. One night a month later, we were making risotto on the ridiculously small electric stove. 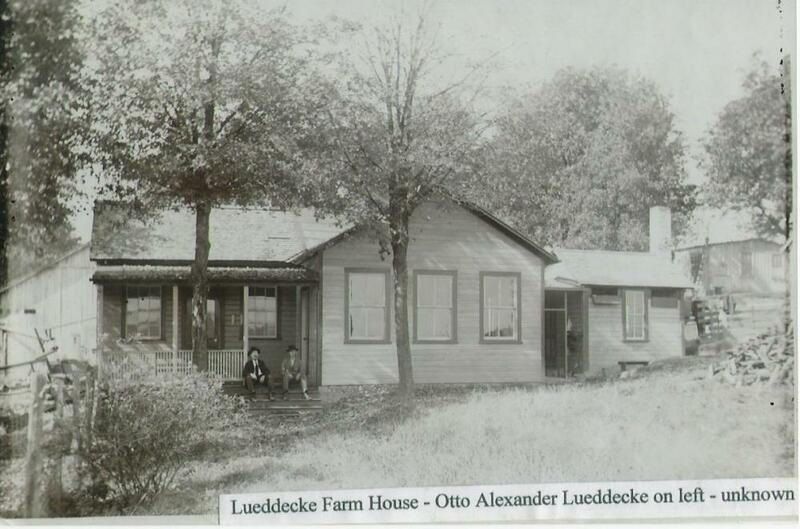 That fast tracked the renovation. Where the stove is now, there used to be a wall and doorway into a useless space. 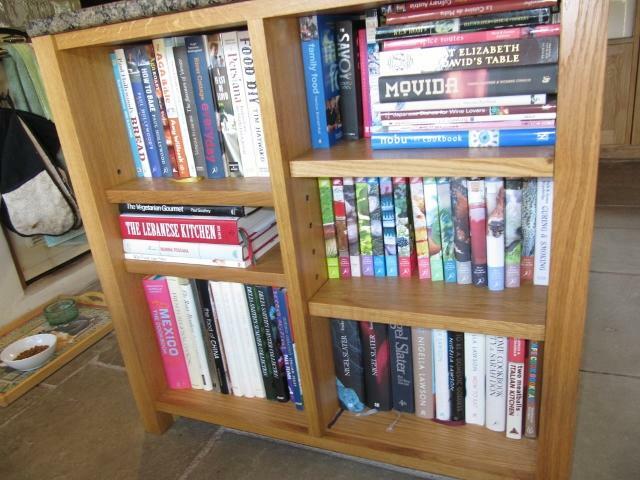 We're happy with it mostly, the pantry has pull out shelves/drawers, as do many of the cupboards. Above is looking west, best to close the blinds late afternoon to avoid seeing the dust. Form the other direction, towards the dining room which rarely gets used. Through the windows (north facing, a good thing in the Southern Hemisphere) is a full length deck 9m X 3 m which is where we usually eat. 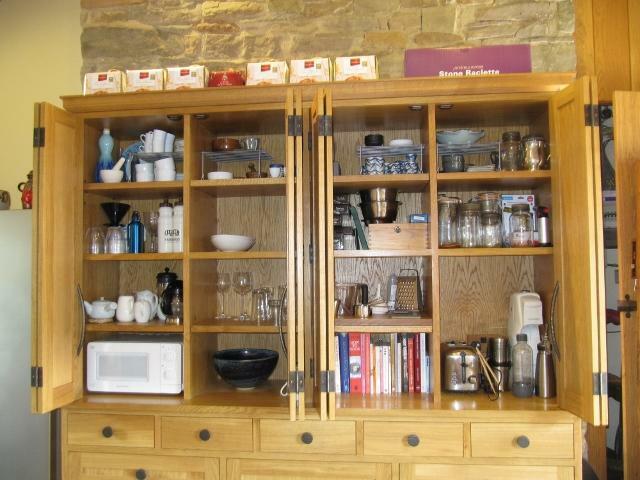 The kitchen itself is six meters long, with lots of storage I still manage to fill. Well, I was going to show you the before photos, but I cannot access the network drive it's on for the life of me. So you just have to imagine a space with a grotty Belfast sink, two side cupboards, a terrible unrestored coal fired Aga that didn't work very well, a Baby Belling on a little stand with a microwave below it, 2 basic beech Ikea shelving units for storage, a grotty table for food prep, and a fridge. All on a grotty flagstone floor full of stains, with badly plastered walls. Put up with this as a kitchen for 4 years after moving in here. It looked very country but was just terrible. Prep work involved rewiring the whole thing, replastering, sorting out the chimney so it had a legal flue and installing a venting system for the bread oven, sandblasting a feature wall, sandblasting and numerous coats of sealant on the flagstone floor, and a complete oil of the beams and a repaint. I moved out of the kitchen for 6 months and used the kitchen in one of the holiday lets. Here's the view towards the door. 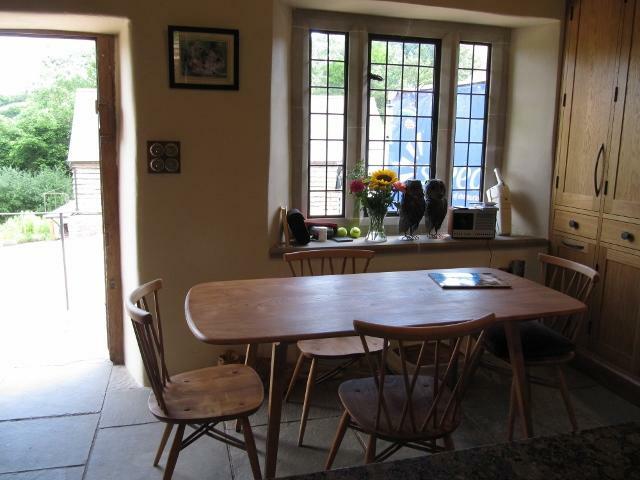 The dining set is Ercol "Candlestick", probably from the 1950's. I bought it off eBay and my carpenter refurbished it. 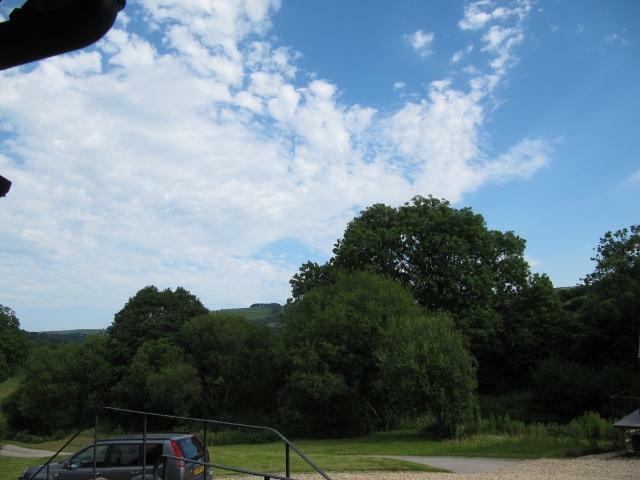 Bonus pic up the valley which is the view from the kitchen door! Our two duckponds are directly in front but there is so much vegetation this time of year that you can't tell. Tall unit that goes all the way up to the ceiling. I store little used items like my wine making kit, my jam pan, my fruit press and party wine glasses in the top sections. From left, shelves with bottled things and wild bird food, drawer with scrubbers, pull out unit to house our coal hods. Second section has pull out shelves for our spirit cabinet, another drawer of spare cloths, bucket and vegetable basket below. 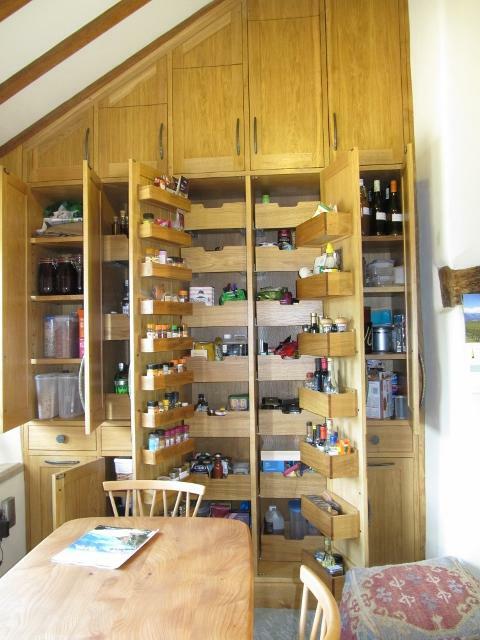 Third and fourth sections are my full size pantry larder, with herbs and spices and oils on the doors. Final section has some home pressed apple juice for applejack, spare storage containers, cakes and breads, and cat food, with drawer for garden gloves and another pull out hod container below, with Simba's throne in front. The doors are all oak and the brass bronzed handle were made by a wonderful chap called Ged Kennett. The knobs were a custom make for the kitchen. 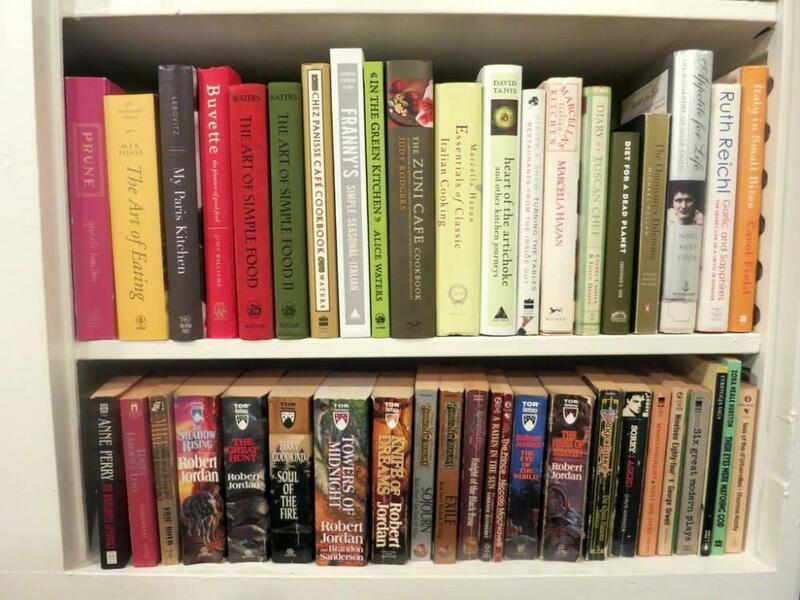 Obligatory bookshelf pic. 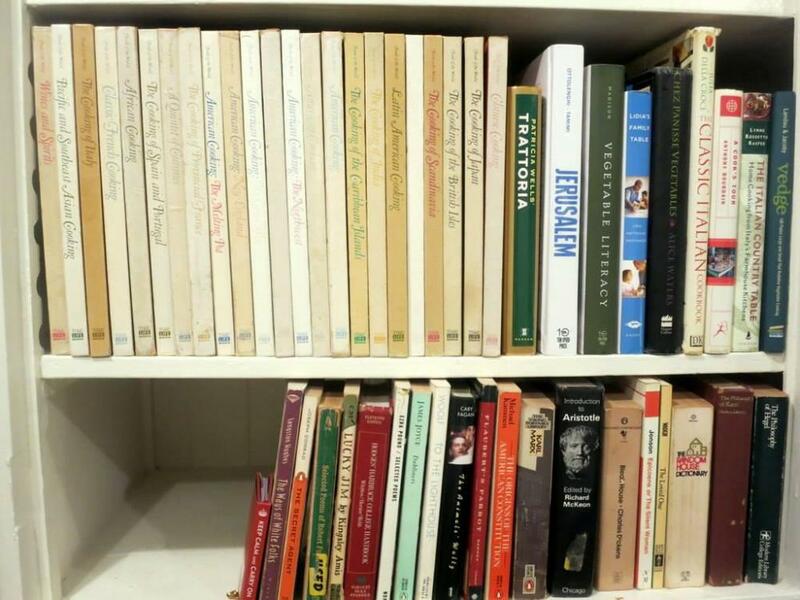 I have overflow in the housekeeper's cabinet and also in a bookcase in the hallway. The rest of the island unit has three drawers for pots and pans (and the IP) the oven side, three for plates and mugs and other stuff in the sink side and one traditional cupboard where I keep big stuff like the sous-vide and the breadmaker and the like. 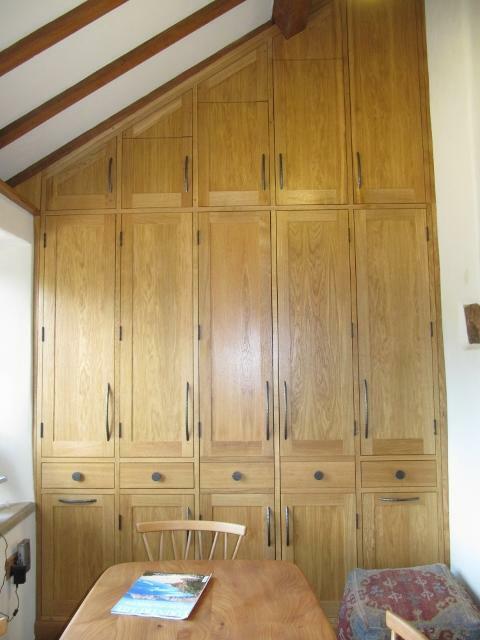 The housekeeper's cabinet is inspired by traditional Marches cabinets, except with bifold doors to save space. Fridge with rumtopfs to the left. I am hoarding panettone because Lidl and Aldi Panettone keep forever and hubby is a fan of bread and butter pudding. Japanese dishes on top (with festival mugs), then from left to right teapots, a caravan microwave which just fits the space (and I pull out slightly if cooking something steamy), serving bowls, glassware, a lovely fruit bowl from Ireland, serving cutlery (and a posh glass bowl for trifles), odds and ends, bookshelf, Kilner jars and my Sodastream, toaster and small grinder station. The drawers house small things at the top, then casserole dishes and the like to the left and mostly baking stuff to the right. 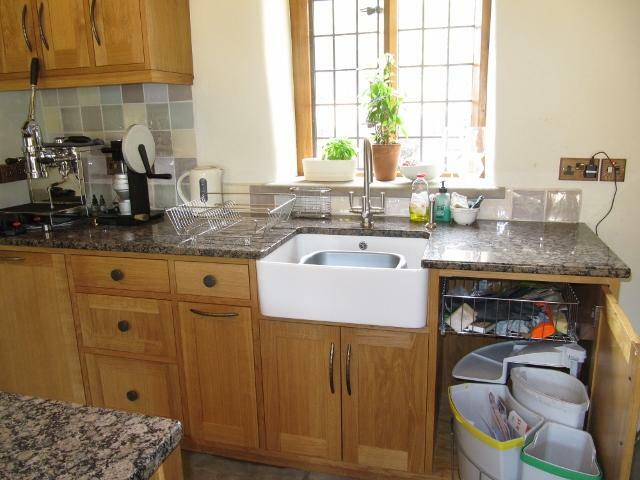 Sink run has Miele dishwasher, effectively 5 drawers but two are insert drawers to make the look cleaner, utensil drawer and pull out oil / utensil unit, cupboard for the usual stuff under the sink, and a recycling centre. 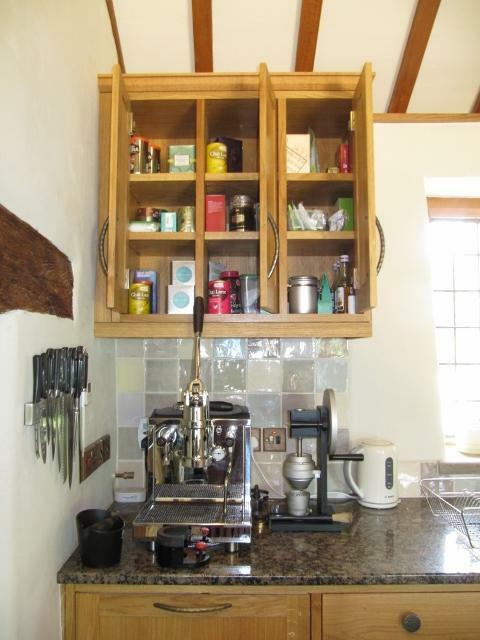 Tea station lives on top with the Londinium, kettle and whatever the grinder was called. We are long on teas and coffees! Spares are at the top as I need a small stepladder to reach them. Knives on strip to the left. The inglenook houses a board for sweeping out the bread oven ashes tucked in to the left, a refurbished coal fired two oven AGA, a cupboard for Aga tools and baking trays, then a Neff oven and hob for in the week (we usually only light the AGA when hubby is home). 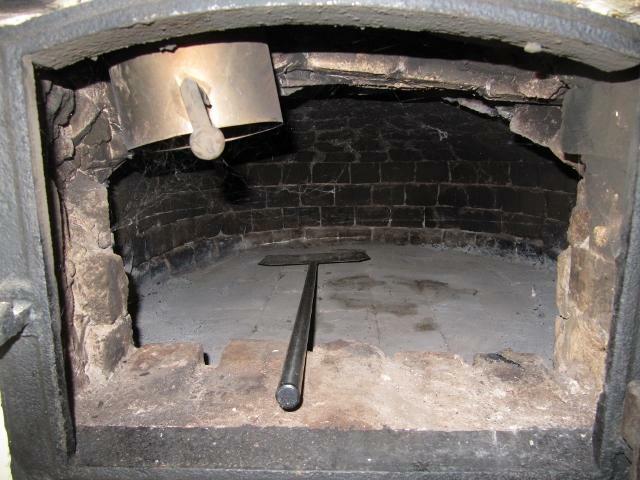 The bread oven is original to the Victorian extension although the door has been raised in the past to accommodate worktop heights. We have tried it once, it worked surprisingly well although it was a big smoky in the room still even with the new vent! Peels live in here to keep them out of the way. It was an awful lot of effort and disruption but I am pretty happy with how it's turned out. 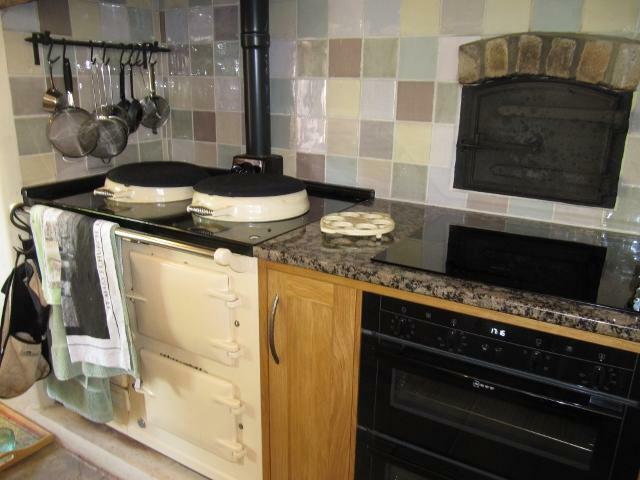 The kitchen was cold, draughty and unpleasant before and now it's a pleasure to cook in. Thanks very much for sharing. 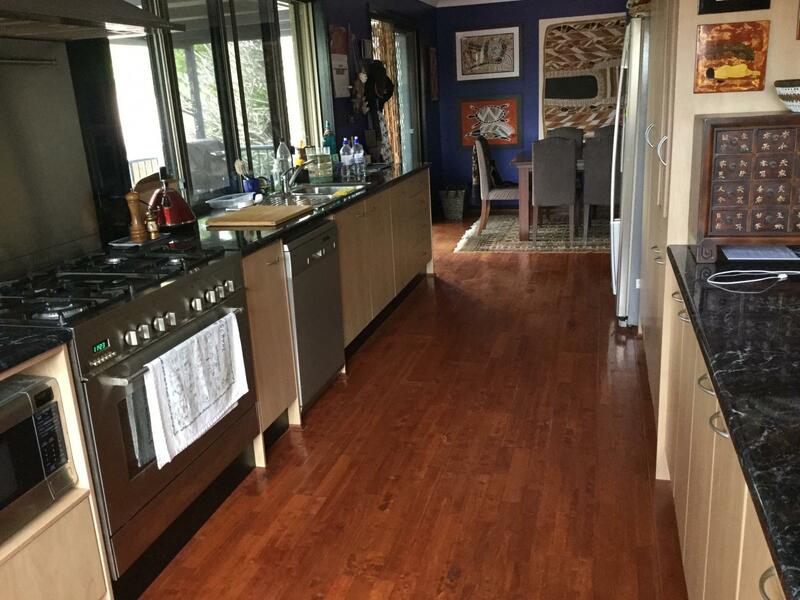 It is an amazing kitchen and I can remember a time when I would have been green with envy but having reached a certain age and a certain level of infirmity I leave your photographs with a new level of appreciation for my tiny galley kitchen. Now if only I could fold some of your fabulous storage space into it. Heh. The fitters couldn't believe how much space I wanted - they kept on asking if I was sure. It's not just the kit (although I do have a fair few toys), it's the space to store damson gin in the process of stewing, batches of jams and all sorts of things. I am spoiled for space but it's amazing how quickly it fills! and # 4: the loft f those cabinets !! The high level cabinets require a full size stepladder and my hubby to wield it, as even on the top step it's a bit too high for me! Luckily they really are things that are only required once or twice a year at most, so I can plan for the taller person to retrieve them for me. Wow!!! Loving all these new pics. Sartoric, love love love your floor. Tere, love love love your tiles. Very nice kitchen! A lot of thought went into the design. We love our Miele dishwasher, often asking: "Is it turned on?". So quiet. 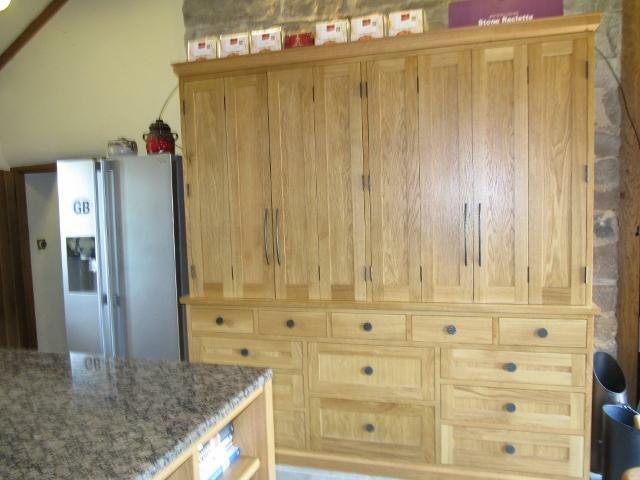 Love those handles on the cupboards. They almost need to be that long on the size of cabinet they operate. They are wonderfully tactile as well. There's better pics on his site at http://www.gedkennett.co.uk/handmade_FPB_bow.html and the knobs are a scaled up version of http://www.gedkennett.co.uk/handmade_CPTB_button.html. He's very expensive on his stock items but since it's a forever kitchen we bit the bullet. Fortunately he was marvellously accommodating on giving a decent discount on the custom knobs. Just as well really! Absolutely beautiful kitchen @Tere, I would be jealous if I hadn't grown up in vast houses that were impossible to heat. Perhaps not the case with modern heating systems. We are also fans of Miele kitchen machines. @rotuts you need to visit us, the Wensleydale dairy is just a short drive away and they take full advantage of the Wallace and Gromit link! You can take a factory tour and then stock up at their farm shop. Great ice-cream place just down the road for afterwards, all milk from their small Jersey cows that you can also visit, really beautiful animals. Wensleydale nearly went out of production just before the Wallace a fled Gromit films took off. Bought out fortunately and it has thrived since. @rotuts you need to visit us, the Wensleydale dairy is just a short drive away and they take full advantage of the Wallace and Gromit link! You can take a factory tour and then stock up at their farm shop. Great ice-cream place just down the road for afterwards, all milk from their small Jersey cows that you can also visit, really beUtiful animals. We're fortunate in that the previous owner installed a ground source heat pump which keeps the running costs down - or at least it did once we figured out the installer had never connected up the thermostats to the boiler! (It had on or off before that, which was ouchy price-wise). But now it works, it works well. Gorgeous kitchen, @Tere. I would be delighted to be within shouting distance of any dairy where they made decent cheese; our closest cheesemaker is Kent Walker Cheese in Little Rock, a two-hour drive. 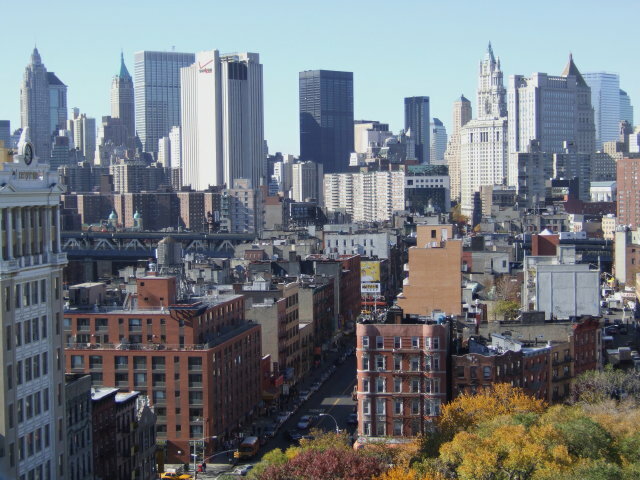 But I have a meeting there next week, so will make a KW stop on the way back. 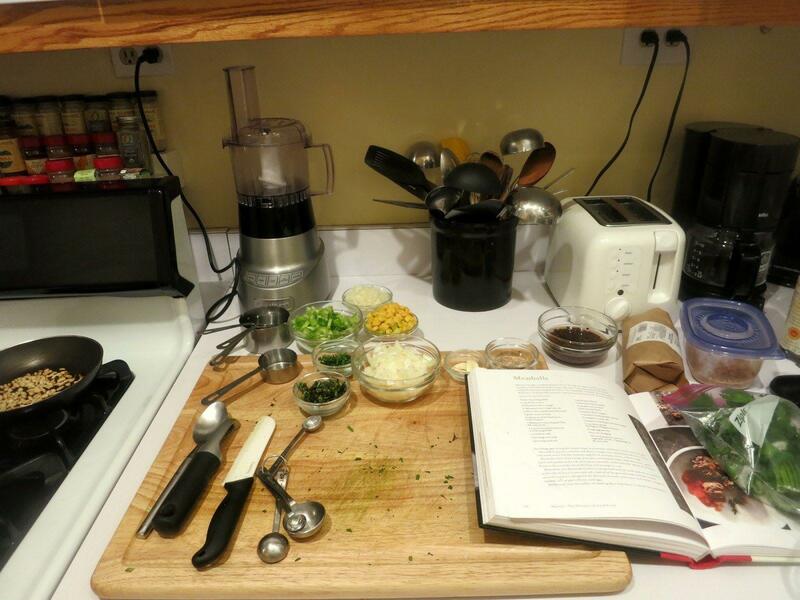 @sartoric, your kitchen looks like a marvelously efficient galley model. Like Shelby, I love the floor. I want hardwood in my next kitchen. OK. I kinda cleaned up. Kinda. My house is a rental, and was built in the late 1940s/early 1950s -- the ubiquitous three BR-1-bath GI Bill house. Before I moved, someone had added a den, a laundry room and a storage room to the rear, taking out the back wall of the kitchen and installing a peninsula cabinet with overhead cabinets looking out into the new den. This is where a lot of prep gets done, and fresh produce that doesn't need to be refrigerated is stored. I was making bread this morning. 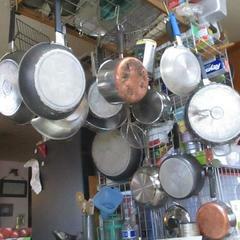 Upper cabinets hold dishes, plastic ware, assorted serving pieces; they reach all the way to the ceiling. Base cabinets hold baking pans, other pots and pans, and assorted junk. Drawers are, from right, silverware, gadgets, paper and wraps, more gadgets, and two junk drawers. To the left of the cabinet is the opening to the dining room; to the right, the doors to the den and hallway, and the cabinet with the sink. 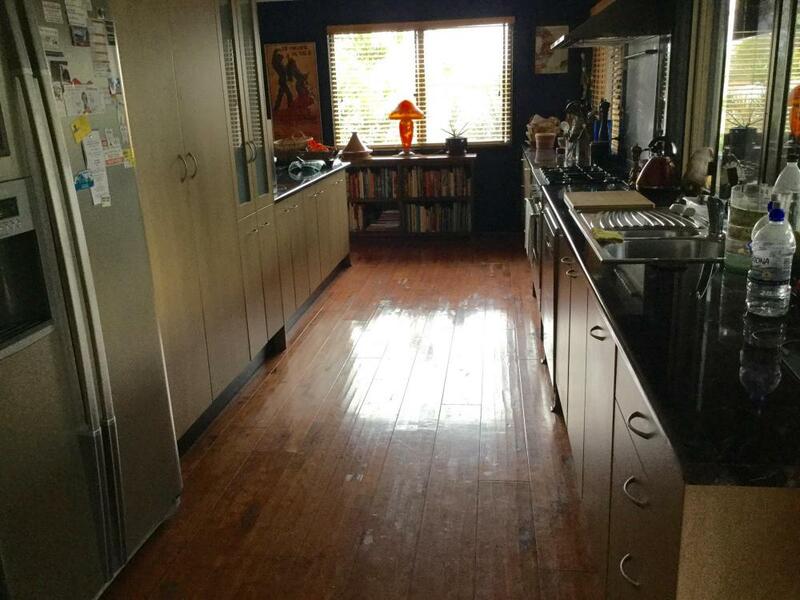 Immediately opposite this is the wall with stove, fridge and small (30") countertop. As you can see, this is also where my electrical appliances live, as it's the home of the only wall outlet in the kitchen. Food processor, electric kettle, blender and Kitchenaid mixer (under its hood) stay out at all times because all but the kettle are too big and bulky/heavy to move. Kettle could move now, as I don't use it as much since we got the Keurig. Upper cabinet holds spices. 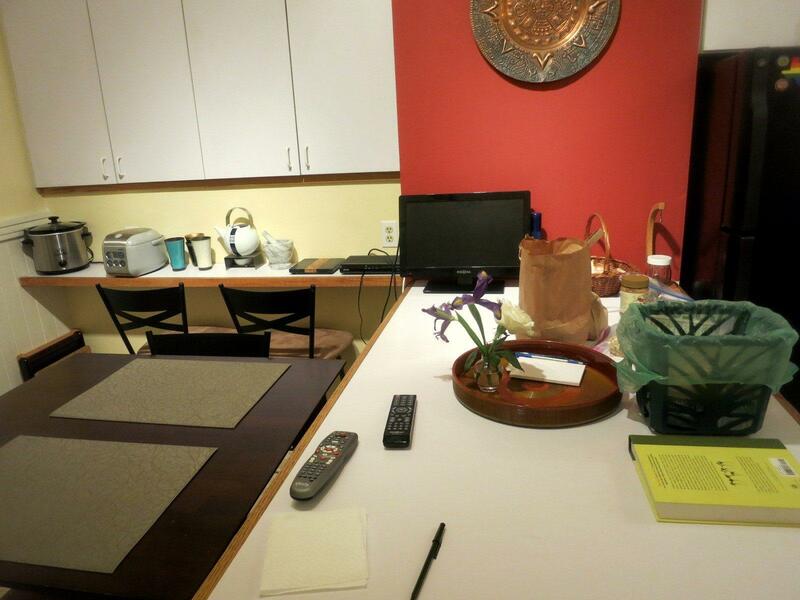 Drawers have utensils and hot pads, lower cabinet has other small electrical appliances. 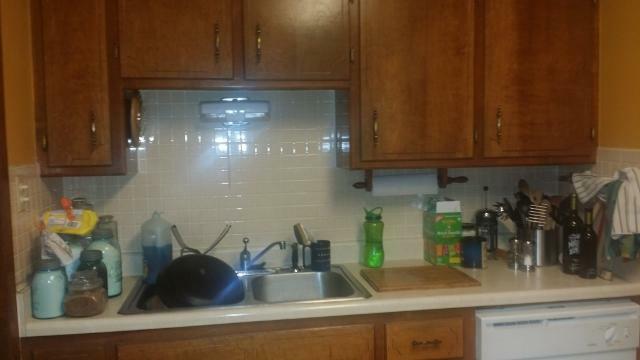 This wall/counter is the bane of my existence. Besides the obvious sink and dishwasher (those are CLEAN) pans draining in the sink! ), there are antique Ball jar canisters and a conglomeration of stuff that doesn't seem to have anywhere else to live. 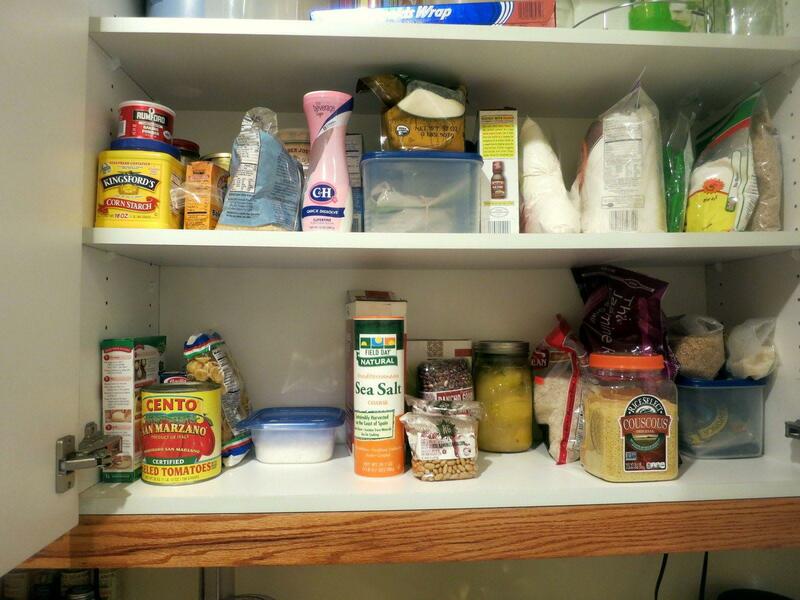 The wall to the left is the wall of the pantry, which is full room height but only about two feet wide. There IS an outlet on the over-sink light fixture that I can use if I want to risk electrocution. It's far from a great kitchen, but it's not too bad. See the clever flaps just under the eaves to let the hot air out?